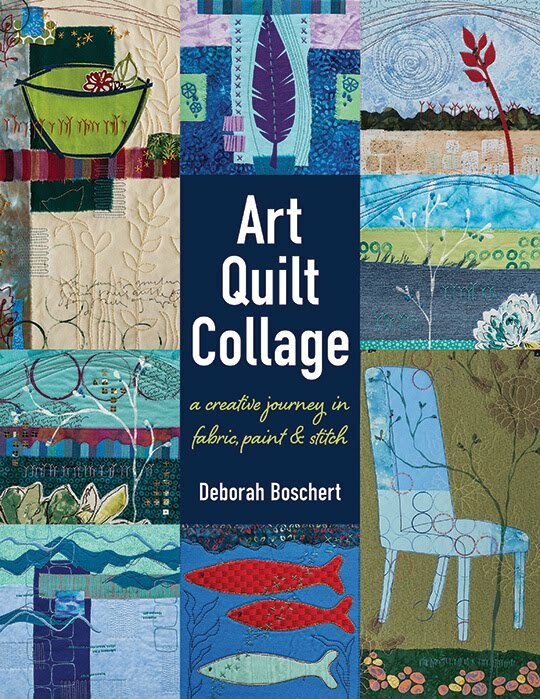 Deborah's Journal: Fabric Printing at Home Blog Hop and GIVE AWAY! Fabric Printing at Home Blog Hop and GIVE AWAY! 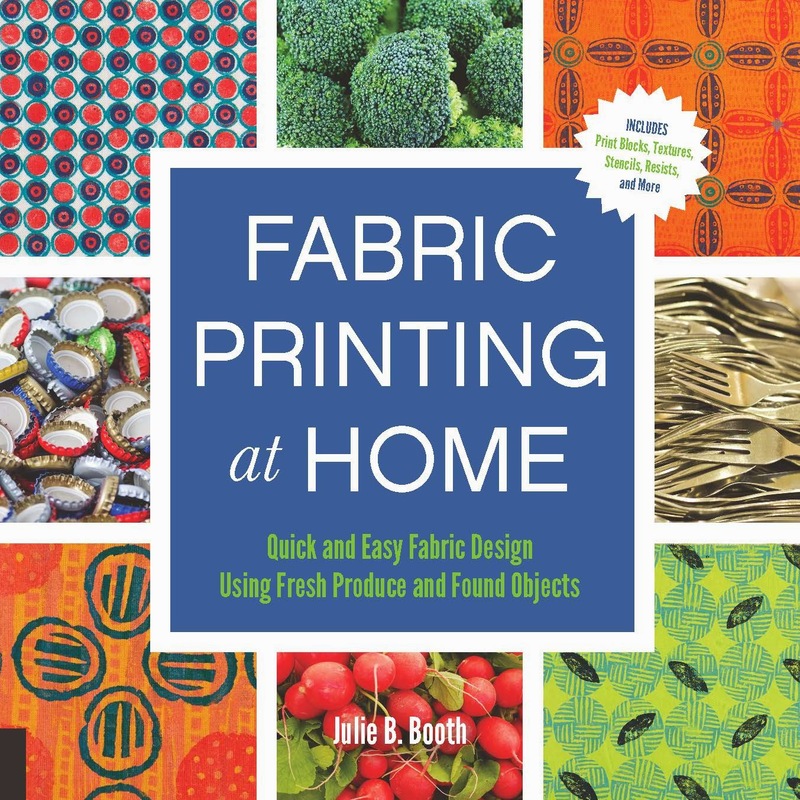 I am thrilled to join in the blog hop celebrating Julie Booth's amazing new book! It really is great. So many wonderful -- and simple -- ideas! One thing that jumped out at me was the many ways she uses brayers for printing. I should totally do more of that. I really only have one brayer, but I pulled this wacky rolling pin out of a drawer in the kitchen along with a piece of plastic wrap. Hmmmm. Potential! 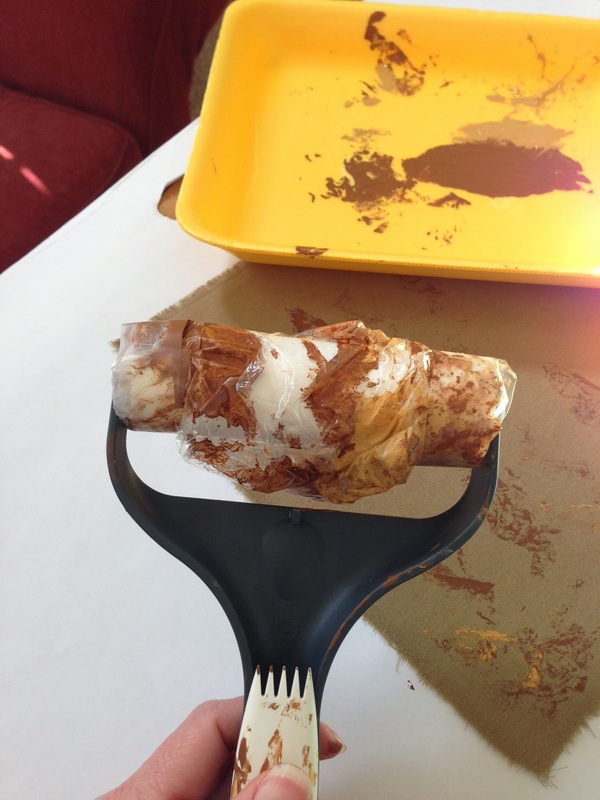 I wrapped the rollers with the plastic wrap and rolled it in some tan and brown paint. Viola! I love this subtle texture and the way I could just roll it right across the fabric in any direction. Here's the thing about Julie's book. This isn't a specific technique from her book, BUT... looking through the book got me thinking differently about the potential for various tools. There are techniques with rolling pins and with plastic wrap, so that gave me the idea to put them together. A book that can get you to think creatively and give you ideas about how to put your ideas into action is a super valuable resource! Of course, the book is full of actual techniques and excellent pictures and very helpful step-by-step instructions! I'd definitely recommend it for your bookshelf. Check it out. Or win a copy by commenting on this blog post! Any comment will do or tell me your favorite color combination. I need ideas for more paint to squeeze onto my palette! I'll choose a winner one week from today on February 17. Be sure to check out all these amazing blogs. Everyone is giving away a copy of the book. Lots of chances to win! plus, Julie is giving away all kinds of goodies on her blog every day during the blog hop. Playing lately with Teal and Burnt Sienna. Lots of one and touches of the other. Am just loving this blog hop. Every artist is choosing a different part of the book to talk about and adding their own creative twist. I have a brayer, but now I have a brayer with a new idea to use on my fabric. very cool! This looks like fun! 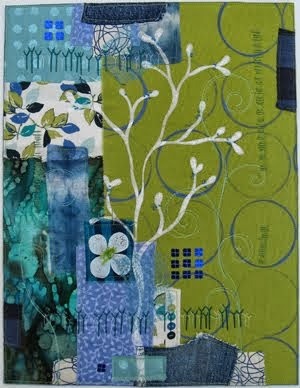 I need to get out my solid fabric and some paints to see what I can create. Maybe try turquoise with just a spark of red. Pretty intense. Looks like there are some great ideas in this book! Thanks so much for the chance to win! From reading all the blogs on this hop, it seems like this is a must have book. Favorite is hard, but probably magenta and blue. favourite colour combination would be blue and white. Inspired by the gals at our local modern quilt guild, I've been experimenting with turquoise (and it's sisters on the colour wheel) and various greys. Thanks for your demo. Teal and violet are nice! Mustard and teal at the moment! These ideas look like a lot of fun. I love to mix a warm yellow with alizarin crimson...it made the prettiest rusty orange...a great color to use on your project in this blog post! Depending on which yellow you use...this could be either transparent or leaning towards opaque! I love when ideas are sparked and motivation is high! Sorry, no favourite colour combos...I like so many it would be impossible to choose! interesting looking rolling pin! cute idea too! I've been loving mustard and raspberry for quite some time now. I plan on trying your plastic wrap/rolling pin idea. I really like that kind of texture! Thanks for the chance to win the book!! I love aqua and coral together. 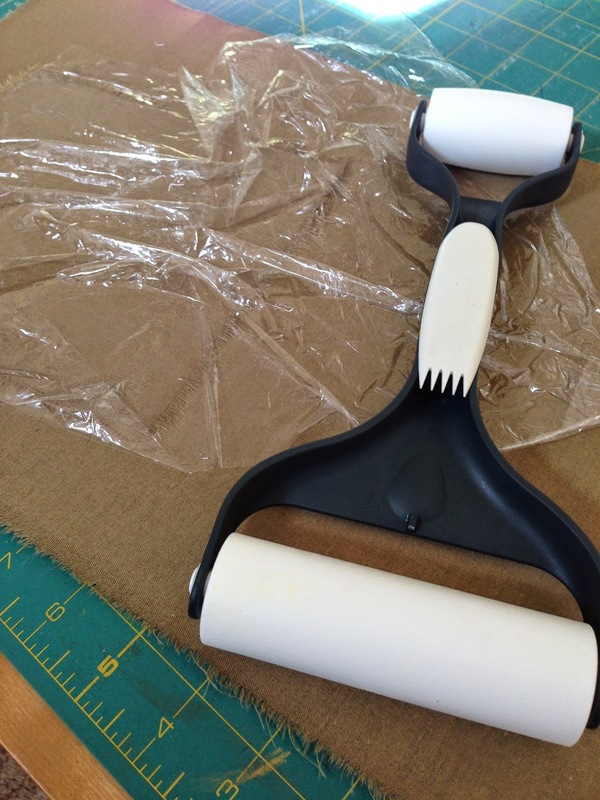 Maybe I'll replace my poor brayer and get some Saranwrap. Thanks for letting us know about this - I really enjoyed all the different blogs and the tips and techniques. A favorite color, that is hard - I love all colors but I guess anything in blue family. Hmmm what an interesting use for a rolling pin and plastic wrap. Wonder how a rolling pin with elastic bands would work? I have lots of fave color combinations, but really love cerulean blue and bright green - I use procion mx dyes a lot, but would use these colors with fabric paints as well. Thanks for the great post! I love blue and yellow. Or blue and orange. Or . . .
right now my favorite color combo is purple and yellow! Thanks for the chance to win! Well Deb, now I have to try to find one of your roller things. I am addicted to printing with " stuff". This book is fantastic. Trying to win but will buy for sure if I don't. Very cool technique, would love to win the book and learn more! I will offer a not so unique color combo: green and blue. Maybe 'cause I have indigo and weld dyes on hand! Thanks for the chance to win the book...I've been making fabric postcards recently and would like to expand my skills and ideas! Looks like a great book! Thanks for there opportunity to win a copy! purple & green always work for me...great colors together in nature....wisteria, lilacs, lavender, violets, hyacinths etc. Turquoise and yellow - I love those colors together! This really looks neat! Thanks for a fun blog hop! 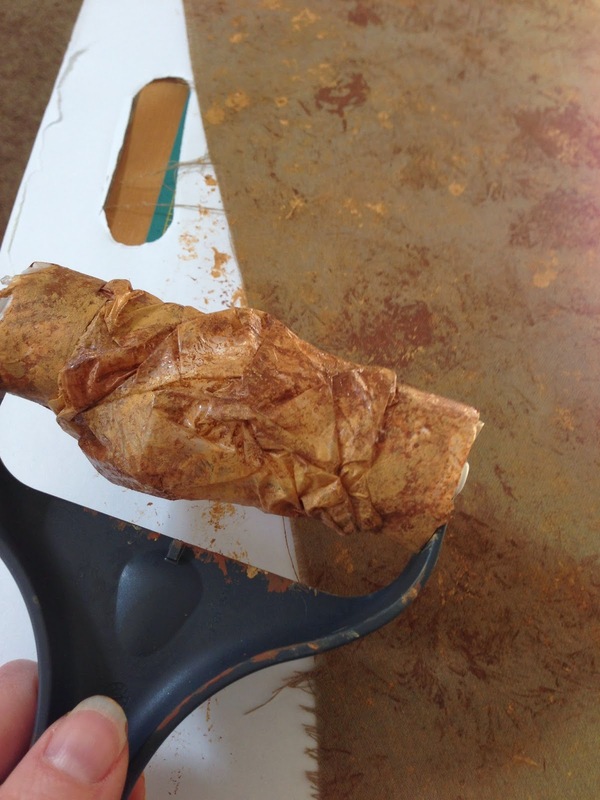 Your plastic wrap roller gave some interesting texture. Try squeezing out some Mango and Fuchsia- nice combo. That's one interesting looking roller, Deborah! Hmm, my favourite would be blue on blues. There are really a lot of things you can do with brayers. Your idea is very clever. Favorite color combos, greens and pinks/reds, and purples/yellows. Would love to win a book! Thanks for the giveaway! My favourite colours are typically browns, a little gold and then a touch of either red, berry pink, or purple to pop it. But when it is cold like this, I like to think of spring and summer, and I tend to prefer turquoise, blue, a little silver and a touch of a reddish pink. One of my favorite color combinations is red, green and gold.